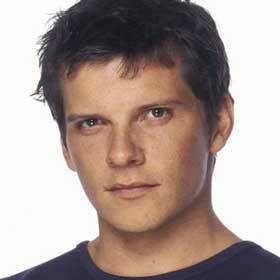 Nigel Harman first became known in 2003 playing the role of Dennis Rickman in the BBC soap EastEnders. He recently starred in the final TV series of Hotel Babylon. Since leaving EastEnders in 2005 he has worked appeared on television and in a number of films. Theatre credits include the original cast of Mamma Mia! , Sky Masterson in Guys and Dolls at the Piccadilly Theatre and on tour, Kerry Max Cooke in The Exonerated at Riverside Studio Theatre in Hammersmith, Harold Pinter’s The Caretaker at the Crucible Theatre in Sheffield and on tour, The Common Pursuit at the Menier Chocolate Factory for a limited run, Three Days of Rain at the Apollo Theatre, Public Property at the Trafalgar Studios and True West at The Crucible Theatre, Sheffield. He originated the role of the dim-witted Lord Farquaad in Shrek the Musical at the Theatre Royal, Drury Lane and is to direct the tour of Shrek the musical which kicks off at Leeds Grand next July. He has just been appearing at the London Palladium playing the role of Simon Cowell in I Can't Sing - The X Factor Musical penned by comedian Harry Hill with with music and lyrics by Steve Brown.